But what did we learn? The match had all the hype but on the day, the Poppies weren’t quite at it. It really couldn’t have been built up anymore. There was plenty of hype and rightly so, after all, it’s not every day you have you have the chance to win a title. However, on this day, Kettering just weren’t quite at their best. They struggled at times against a strong Alvechurch, particularly in the first half when Paul White had to be at his best and the visitors also struck the crossbar. That’s not to say the Poppies didn’t have their chances and when Craig Stanley scored his first goal for the club, it looked like the title would be delivered. But the late goal for Alvechurch ended the hopes for this day as the day ended on a flat note. This is football and you can be as high as a kite one minute, only to be brought back down to earth in a heartbeat. It ended up being one of those days for the Poppies, just when they didn’t need it. It was a fine turnout from the Kettering fans but it felt like everyone was waiting for someone else to do something. As expected, a bumper crowd turned out for the big occasion. Over 1,500 fans were on hand to see if the Poppies could clinch the title. But it has to be said, the overall atmosphere was a bit flat right from the start. Maybe it was nerves? Maybe it was sheer expectation? Either way, it felt like the fans were waiting for the players to do something and it felt like the players were waiting for the fans to give them a lift. 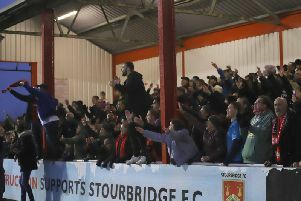 Things bubbled up nicely when Craig Stanley grabbed the equaliser, only for things to fall flat when Alvechurch well and truly ended the party plans at the death. The one thing you can guarantee is that when the Kettering fans invade Halesowen next weekend, the away-day atmosphere will be something completely different. Let’s give Alvechurch some credit, they’re one of the better sides to visit Latimer Park this season. It’s easy to overlook the opposition sometimes but Alvechurch deserve some credit. They’re one of the better teams I have seen at Latimer Park this season, with the exception of Kettering themselves of course. They have big and powerful defenders who are a threat in both penalty areas. And they have some impressive attacking players. The likes James Roberts, who is on loan from Hereford, and Josh March caused the Poppies real problems particularly in the first half. This was supposed to be Kettering’s day but Alvechurch didn’t read the script and came along and showed why they are heading for a play-off place in their first campaign at Step 3. And, on this evidence, I wouldn’t be betting against them in the extended season. Paul White has saved the Poppies enough times to be cut a bit of slack when he makes a mistake. Who’d be a goalkeeper? 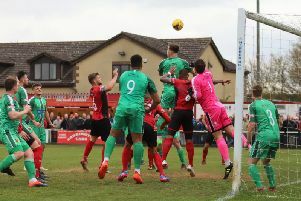 Let’s be honest, Paul White has done a fine job between the sticks in his time at Kettering Town and he has become a popular figure with the supporters. And, even in this game, he had to make three or four excellent saves to keep his team. But, such is a goalkeeper’s life, you’re only one mistake away from having the focus on you. Nine times out of 10, White is holding on to Mitch Botfield’s late strike. But on this occasion, it squirmed through his legs and it proved to be the moment that meant the Poppies didn’t clinch the title on this day. But White’s record has, in general, been exemplary. From what was being said, he held his hands up in the dressing-room after the game. As far as character is concerned, little more needs to be said. But you won’t find many fans pointing the finger because they’ll know just how important he has been to the team over the past couple of years. All roads lead to Halesowen, winning the title on the road would actually be quite fitting. So one chance to clinch the crown has gone begging. The next one comes at Halesowen Town next weekend in a game the hosts have to win to stand any chance of survival. The Poppies, on the other hand, just need a draw to seal the deal. Marcus Law’s team will be heavy favourites to go and finish the job and they will, no doubt, be backed by a large army of fans in the West Midlands. It would, of course, have been great to seal the title in front of a home crowd. But, given how good Kettering have been on the road this season, it would be almost fitting if they got over the line in an away game. They have a few days to stew over this defeat and then it will be time to go again. Let’s hope they finish things off next weekend.